Does your breakfast lack team spirit?!? Spice up the most important meal of the day with the new ProToast Elite toaster from Pangea Brands. This black retro-style appliance has a sleek new design that includes full color graphics of the Seattle Mariners team logo on front. 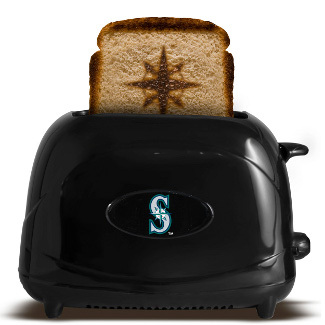 The ProToast Elite toaster features adjustable settings and can accommodate 2 slices of bread, leaving the mark of the Seattle Mariners logo on every piece of bread. It can toast Bread, Waffles, English Muffins, or Toaster Pastry. Officially Licensed MLB product. Two-Slice Toaster with Cool-Touch Housing with Reheat, Defrost, and Quick Stop Functions. Adjustable Thermostat, Automatic Manual Switch-Off and a Removable Crumb Tray for Easy Cleaning.